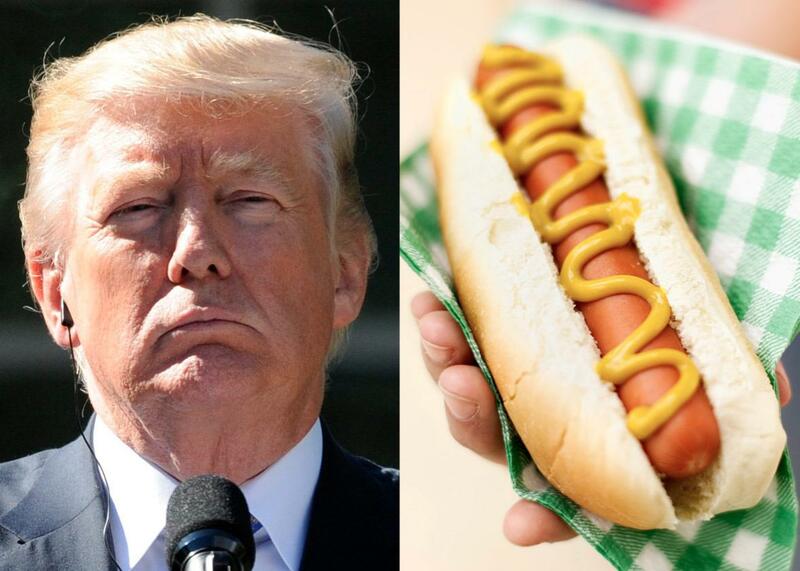 Would $1 million in hot dogs violate the Emoluments Clause? A delicious hypothetical at oral arguments in an anti-Trump lawsuit. A federal court case about Donald Trump digressed into a discussion about hot dogs on Wednesday. In a federal courthouse in Manhattan on Wednesday morning, lawyers for the Department of Justice tried to persuade Federal District Judge George B. Daniels to toss the civil lawsuit accusing the president of violating the Constitution by accepting foreign money while in office. Perhaps the high point of the morning came when a Trump lawyer conceded that if the president were to accept $1 million in hot dogs purchased from an imaginary Trump hot dog business as a gift to sign a foreign treaty, he would probably run afoul of the most obscure constitutional provision you’ve never heard of. Metaphor, meet the president of the United States. You may recall that back in November everyone was casting about trying to find a name for the phenomenon wherein a presidential candidate who promises to release his tax returns if elected and declines to do so, then promises to divest himself of his foreign business interests from which he would profit as president and fails to do so, and then stands next to a tower of empty folders and tells us ethics rules don’t apply to the White House and he doesn’t care if you’re mad about that. You may also recall that this was around the time the word emoluments became something other than that stuff you use to keep your skin smooth and supple. The Foreign Emoluments Clause can be found in Article I, Section 9 of the U.S. Constitution, and it bars anyone holding an “office” from accepting presents or emoluments from “any King, Prince or Foreign State” without “the consent of Congress.” (The Constitution actually has three separate emoluments clauses, but only the foreign and domestic clauses came up in oral arguments on Wednesday.) In the simplest possible terms, the Emoluments Clause prohibits government officials from accepting gifts or payments from foreign governments. Here’s the sticky bit: We don’t have a lot of doctrine in this area because it’s never been litigated, chiefly because most presidents haven’t wanted to look like they were cashing in on the office with club fees, Chinese trademarks, and jacked-up hotel drink prices. But this president doesn’t care about any of that. Because he failed to fully divest from his businesses and because foreigners are dropping a whole lot of cash at Trump properties, the watchdog group Citizens for Responsibility and Ethics in Washington, or CREW, and co-plaintiffs Eric Goode, Jill Phaneuf, and the Restaurant Opportunities Center United filed a lawsuit in New York claiming the president was violating the Emoluments Clause. There are two similar suits pending in other courts. Arguing today on behalf of the president, Deputy Assistant Attorney General Brett Shumate says the court should dismiss the entire proceeding. Shumate says the plaintiffs lack standing—that they have suffered no particularized injury that merits a court’s intercession. He also argues that the court has no jurisdiction to enjoin a sitting president from participating in commercial business, and he says the plaintiffs have incorrectly defined emoluments so as to preclude anyone in office from holding any interest in a business with foreign income. Judge Daniels lets him proceed largely unchallenged as he states that CREW and the hospitality plaintiffs alleged harms too speculative to be cognizable and that CREW opted to “inflict injury on itself” by bringing this lawsuit and focusing money, research, and resources on this particular endeavor as opposed to other issues. Judge Daniels stops to ask a question only when Shumate contends that Trump is taking no government action over the hotel and restaurant markets, saying he’s merely participating in them. “But you can be in a market and also control it,” notes Daniels. Shumate replies that this is a highly competitive market with hundreds of businesses and that no two entities are actually competing. Judge Daniels stops him to say the plaintiffs allege they lost business to Trump properties. Shumate says no, they are asking the court to infer injury. Shumate concedes that he is not. Deepak Gupta of Gupta Wessler argues on behalf of CREW, and he has a tough time getting past the standing arguments. Daniels isn’t really buying that at least one of the CREW plaintiffs has standing, and he doesn’t seem at all persuaded that CREW itself does. He tells Gupta that the Emoluments Clause “is not an anti-competitive provision. It’s an anti-corruption provision.” He repeats several times that there is a vast universe of people who want to stay at Trump properties because they believe Trump is awesome, and that those people don’t suffer an Emoluments Clause injury. Gupta says the Emoluments Clause doesn’t confer a right, but it does mean courts can step in and remedy violations. But when Daniels begins putting air quotes around phrases like “diverting resources,” it’s clear he doesn’t think CREW has standing to claim harm. “They’re not diverting resources if they just want to play policeman,” Daniels insists. “I don’t know if CREW had even thought of the Emoluments Clause before this. Most people had not.” Tittering. Gupta replies that the fact that Congress could make exceptions to the emoluments ban doesn’t mean it’s not also justiciable. He spends what’s left of his time agreeing with Judge Daniels that $1 million in hot dogs is an emolument. Shumate ends his rebuttal where he began: that if Trump can’t take money from foreigners at his hotels, President Obama can’t take foreign book royalties and retired military men can’t hold stock in hotels. In a strange echo of what the Supreme Court said in the Bob McDonnell case, it seems it can’t be bad to profit off high office if everyone does it all the time. The subtext to today’s hearing is that if Daniels allows this case to go forward to trial, CREW would be entitled to discovery, granting the group access to the kinds of evidence of corruption and self-dealing that everyone has only guessed at until now. The stranger subtext is that, based on the DOJ’s cramped reading of emoluments, it’s hard to imagine any government official could ever be in violation of anything. As we walk out of the building wondering aloud whether the same president who profits daily off his hotels and clubs and trademarks might take $1 million in hot dog–based bribes, it’s hard to believe he couldn’t get away with that and a whole lot more.